It was one of our city’s finest moments - the 1988 Winter Olympics - and during it all she was known as “Canada’s Sweetheart”. 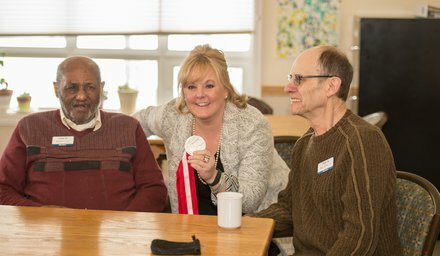 Now, Elizabeth Manley has returned to Calgary - the site of her star-making turn as silver medalist in ladies figure skating – to help raise funds for the Alzheimer Society of Calgary. 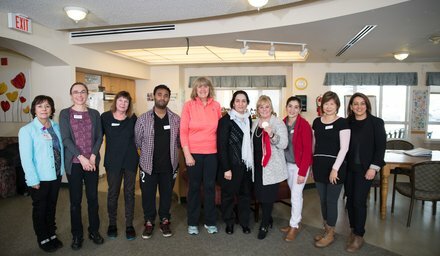 While in town, Manley attended a fundraiser hosted by Burnet, Duckworth and Palmer LLP (BD&P) and visited members of the Alzheimer Society of Calgary’s Club 36 Adult Day Program at the Harvest Hills location. “My visit to Club brought back a lot of memories for me because my father was involved in a day program,” said Manley. Alzheimer’s disease is a cause close to Manley’s heart. Her father, Bernard, passed away from the disease in 2010. And while her on-ice accomplishments are many, Manley’s dedication to raising awareness about Alzheimer’s disease and lending her famous name to the causes she is passionate about makes her even more of a star in our eyes. 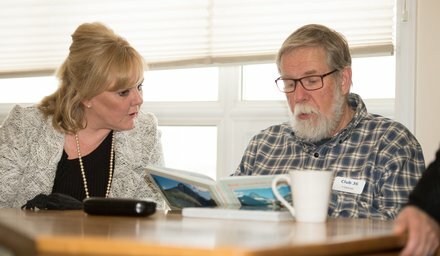 Thank you to Elizabeth for all her support, including making time in her busy schedule to visit Club 36 Harvest Hills. And special thanks to BD&P for both bringing Elizabeth to Calgary and hosting the fundraiser.